NOT YOUR ORDINARY PEP PILL! Active people looking for added endurance and increased energy, alertness, focus, improved mood, and enhanced immunity, will find it all in this natural and safe herbal energy pill to boost physical and mental performance. 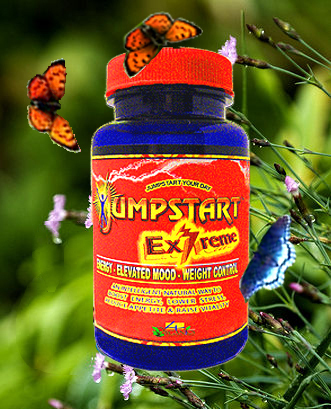 JUMPSTART EX provides a powerful boost of energy, mood elevation and general health enhancement without the unwanted side effects found with most stimulants. Its ingredients actually increase energy, enhance immune function, improve cellular function, and fortify the body without jolting your system with high doses of caffeine and synephrine like other supplements. It is a healthy boost to body, mind, and spirit, and is a powerful stress reducer. We guarantee you'll love it and your body will thank you. Here's a sad truth: most energy pills are not good for you and are simply not a smart or healthy way to get energized. with Ashton Kutcher and Cameron Diaz. For most people, just one dose (two capsules) and you'll feel fully charged and ready to be your best. Most importantly, your body will feel good without the jittery feeling so common in energy supplements and stimulants. This is a perfect case where the whole is truly greater than the sum of its parts - or ingredients. Give your body an intelligent lift that won't do more harm than good. The JUMPSTART EX formula is superior to anything like it, lifting energy and spirits without overwhelming the body, and we guarantee it's the healthiest and most intelligent energy product you'll use. Try it free and see. What Makes JUMPSTART EX Energy Superior? General Warning: All our products are natural nutritional supplements, and should be used as such. We make no health claims. Seek advice from a health professional prior to use if you are pregnant, or have high blood pressure, heart disease, thyroid disease, diabetes, difficulty in urination due to prostate enlargement, or are taking an MAO inhibitor or any other prescription drug. Reduce or discontinue use if nervousness, tremor, sleeplessness, loss of appetite, or nausea occur. Keep out of the reach of children.